Cosmopolitan gourmets are always looking for the next new trend, supported in their quest by insatiable media, marketers, and entrepreneurs. Relatively unexplored culinary traditions around the world are drawing their attention: we can mention West Indian, Peruvian, and Brazilian cuisines among those who are gaining in popularity among US consumers and elsewhere. Other food cultures, however, seem to have had a harder time making their mark on the international scene, despite their undeniable qualities. African cuisines - with some exceptions such as Ethiopian and Moroccan - would appear to fall in that category. Although restaurants showcasing them are relatively easy to find, especially in larger cities, they have not achieved the same kind of prominence as, let's say, Thai or Cuban ones. At times, national governments have played an important role in supporting the global diffusion their gastronomies. 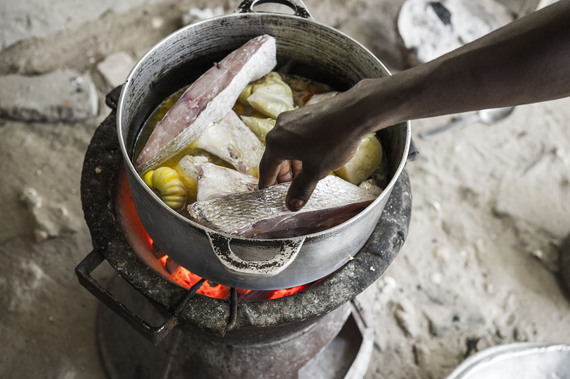 These interventions can prove extremely problematic when defining a national cuisine is fraught with complicated issues of identity, power negotiations among different stakeholders, and the struggle to identify the communities -ethnic, religious, or otherwise - who belong to the national project and whose dishes and ingredients are deemed worthy of being included. Furthermore, although governments around the world are realizing how food can play an important role in supporting tourist flows towards their countries, often funding and expertise in those domains are not readily available. In this varied landscape, West African cuisines are finally acquiring visibility, thanks to their interesting ingredients, their complexity, and their long history. Although African immigrant communities are relatively small in most American cities, restaurants inspired by their counties of origin are popping up here and there, reflecting diverse traditions and culinary backgrounds. In fact, it is impossible to even talk about African cuisine as a single entity, as the continent is home to very different climates, crops, and populations. However, just like some still talk about Chinese food traditions as a monolithic unit with some regional variations, for some restaurant-goers the concept of "Africa" maintains some validity as a filter to make sense of unknown flavors and practices. Besides being worthy exploring in themselves, West African cuisines, could also provide a different, more inclusive filter for Americans - and for anybody living in the New world - to understand many aspects of their own culinary history who are rooted in African diaspora and the forced relocation of African as slaves all along the Atlantic, from the US to Brazil, as well as Colombia and Peru. Who were these Africans? From where in Africa were they brought to the Western Hemisphere? What were the culinary worlds that they carried with them, although they often were not able to fully express them, as they struggled to survive slavery and exploitation? What technical knowledge in food production were they experts in? We know, for example, that the Carolina Gold, a world-famous rice variety in colonial time, thrived in the South of the United States thanks to the skills and experience of West African slaves who were rice growers in their lands of origin. However, their contribution was erased over time, and only recently has their relevance been recognized as crucial. The global circulation of African cuisines and products is not only a thing of the past. Chef and restaurateur Pierre Thiam, author of the successful cookbook Senegal: Modern Senegalese Recipes from the Source to the Bowl, will discuss the unique food culture of his native Senegal - as well as the influence of African practices and dishes on the development of American foodways - at The New School on March 31, in connection with the performance Symposium in the Drum: From Africa to the New World. The conversation will also explore the diffusion of West African cuisines abroad and the challenges they face, from product availability to customers' perception. What's the role of chefs from Africa in making these culinary traditions more accessible and better known? Could their work stimulate curiosity in their culinary cultures as a whole, as my friend chef Michael Elegbede is doing for Nigeria? Could they contribute to the growth of food tourism in their places of origin? We can't give so many responsibilities to West African chefs, or any chef for that matter. Nevertheless, their unique position as informal ambassadors counts. At times, it can count a whole lot.